As we reach the midpoint of the season our race for PFF’s Rookie of the Year award is as tight as it’s been all season. After his first few games, it looked like Cleveland Browns’ quarterback Baker Mayfield was going to run away with the award, but a slew of sub-optimal performances has him just barely clinging onto the top spot, with plenty of movement right behind him. There’s a lot of football still to be played in 2018 remember, but midway through the season here’s where the rookies stand. 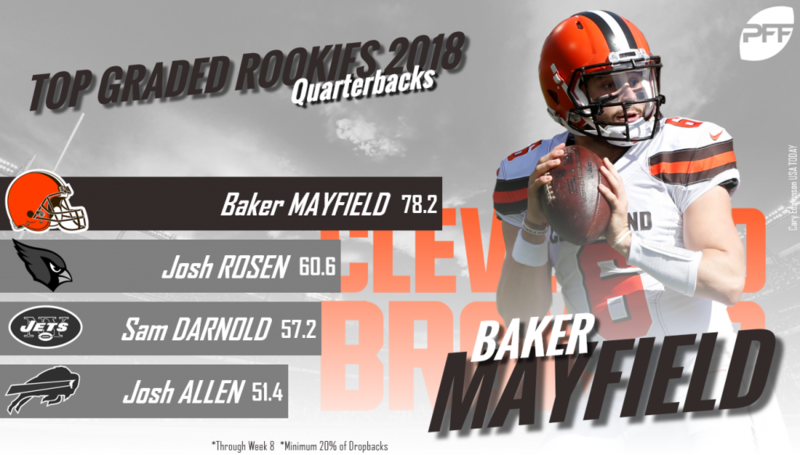 Baker started his career with a bang, grading north of 81.0 in each of his first three games. Since then though he’s hit some rocky waters, from Weeks 6-8 he’s surpassed the 70.0 threshold just once and he’s coming off his worst game so far, earning a 49.2 overall grade against the Pittsburgh Steelers this past weekend. Despite the rough stretch, the number one overall pick still ranks 16th among all quarterbacks in terms of overall grade, and he ranks sixth with a 6.8 Big-Time Throw percentage. Baker’s overall performance at the most important position in all of sports has him clinging onto the top spot in this race, but if he plays as he did against the Steelers when Cleveland hosts the Kansas City Chiefs this weekend, there very well could be someone else at number one to kick off second half of the season. Hand currently ranks ninth among 139 interior defenders who’ve played at least 50 defensive snaps this season in terms of overall grade. The former Nick Saban pupil has been a steady presence in the middle of Detroit’s defensive line all season long, grading over 70.0 in every game he’s played so far as a professional except one (57.3 in Week 3 against the New England Patriots). The fourth-round pick currently ranks 15th among interior defenders with 12 run stops – and he hasn’t missed a tackle in run defense yet – while also ranking 18th among the group with a 12.5 pressure percentage as a pass-rusher. Hand is one of just five interior defenders who currently own a pass rush grade of at least 80.0 while also owning a run defense grade of at least 75.0, putting him in a group with Aaron Donald, Fletcher Cox, Kenny Clark and Geno Atkins. 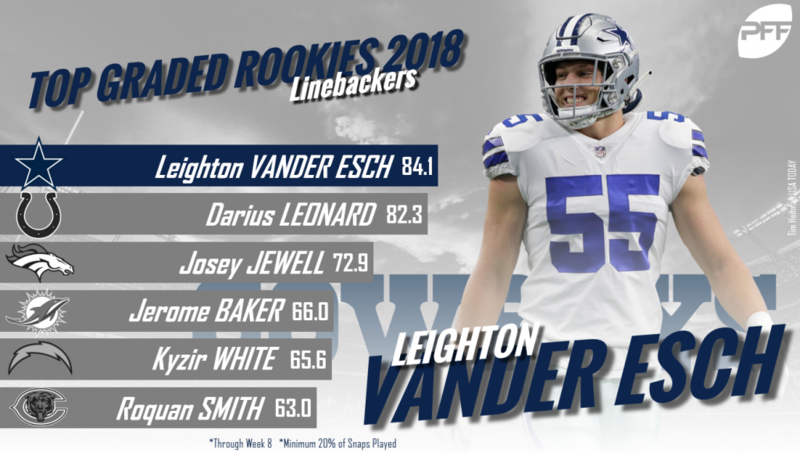 Vander Esch currently ranks fifth out of 120 linebackers who’ve seen at least 50 defensive snaps this season in terms of overall grade. The Cowboys first-round pick has excelled in both coverage and run defense so far as a pro. He’s one of just 10 linebackers who own a coverage grade north of 80.0 as we approach the season’s half-way mark (81.1), and among those 10, only he and Luke Keuchly possess a run defense grade of at least 75.0 (77.8). Vander Esch ranks fifth among linebackers who’ve seen at least 25 run defense snaps with a 13.0% run stop percentage and out of the 43 linebackers who’ve been targeted at least 25 times in coverage he ranks third by allowing just 7.3 yards per catch. 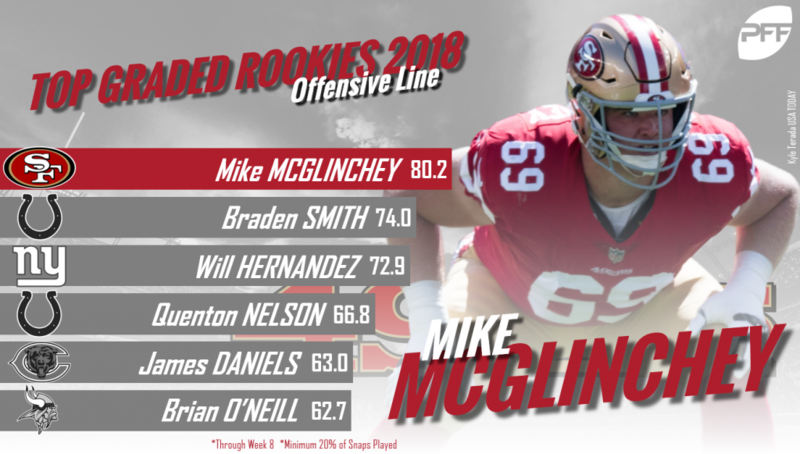 McGlinchey currently ranks seventh among the 80 offensive tackles who’ve played at least 100 offensive snaps this season in terms of overall grade, and he’s really come into form in the last month, earning grades of 77.0 or better in three of his last four games. McGlinchey has been a force in the run game this season, as his 88.6 run- blocking grade leads all tackles, he’s one of just three tackles to own a run blocking grade greater than 80.0. He’s had some issues in pass protection, but the ninth overall pick has taken some big strides in that department, allowing two or fewer pressures in four of his last five games. 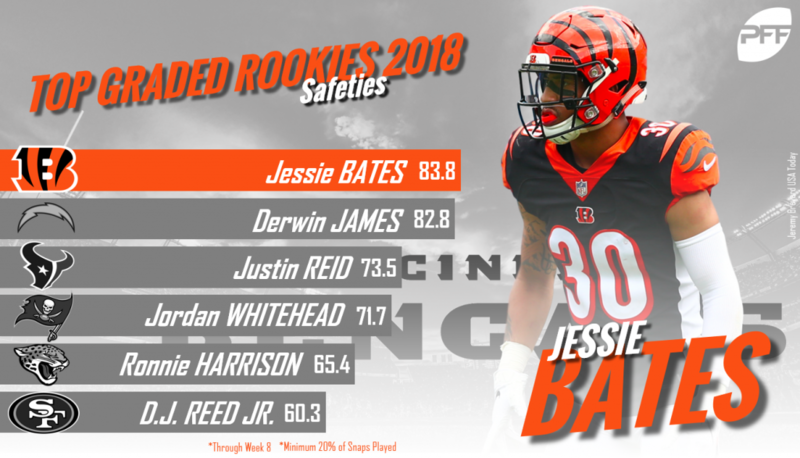 Bates’ performance as a rookie has been a bit of a roller coaster this season, and as a result, he’s found himself bouncing back and forth between our top-10 and the honorable mentions all season long. He’s back in the top-10 though in our Week 8 update after posting an elite 92.3 overall grade over 89 defensive snaps against the Tampa Bay Buccaneers last weekend. For the season, he ranks fifth among 95 safeties who’ve logged at least 100 defensive snaps in terms of overall grade, and he’s one of just four safeties to own a coverage grade of at least 80.0 while also scoring 70.0 or better in run defense. There have been 68 safeties who’ve been targeted at least 10 times as the primary defender in coverage so far this season, among that group Bates ranks fourth by just allowing only 59 receiving yards and he’s allowed a passer rating of just 19.5 on throws into his coverage, the league’s second-best mark. Leonard currently ranks sixth among the 120 linebackers who’ve seen at least 50 defensive snaps this season in terms of overall grade, and he’s the only linebacker in football who owns a grade of at least 75.0 in both coverage and run defense. Much has been made about Leonard’s lofty tackle totals, but if you look a bit deeper into that total it’s even more impressive: Leonard leads all linebackers with 34 total stops and his 4.4 missed tackle percentage ranks seventh-best among the 68 linebackers who’ve made at least 20 tackles this season. James currently ranks ninth among the 95 safeties who’ve seen at least 100 defensive snaps in terms of overall grade, and he’s one of just five safeties who own grades of at least 70.0 in run defense, coverage and as a pass-rusher. James is tied for third among safeties with nine coverage stops and he’s allowed just a 74.4 passer rating when he’s targeted as the primary defender in coverage (21st- best among the 68 safeties who’ve been the primary defender for at least 10 targets in coverage) to go with a 17.4 forced incompletion percentage (15th best). James is just one of seven safeties who’ve rushed the quarterback at least 25 times this season, among that group he ranks first with a 33.3 pressure rate and his 11 total pressures lead all safeties. Out of the 124 cornerbacks who’ve logged at least 100 defensive snaps this season, Ward ranks ninth in terms of overall grade, and he ranks sixth with an 83.3 coverage grade. The fourth overall pick has had some down games (he earned a 48.1 overall grade back in Week 2 against the New Orleans Saints for example), but he’s passed the 80.0 threshold three times this season, including in Week 3 when he earned an elite 90.9 overall grade against the New York Jets. Ward’s tied for first among cornerbacks by either intercepting the ball or forcing an incompletion 14 times this season and his nine coverage stops are tied for 10th most among CBs. One of two players making their debut in our top-10 this week, Alexander currently seventh out of 124 cornerbacks who’ve registered at least 100 defensive snaps this season in terms of overall grade and he ranks eighth among that group with an 82.5 coverage grade. Alexander ranks eighth among cornerbacks with a 25.7 playmaker index (PMI combines interceptions and forced incompletions and divides that total over the number of targets into a defender’s coverage) and opposing QBs have just a 55.7 passer rating when targeting him as the primary defender in coverage this season, the sixth-lowest allowed by a cornerback. Lindsay ranks seventh among the 62 running backs who’ve seen at least 100 offensive snaps this season in terms of overall grade, and his 80.7 rushing grade ranks fifth. He leads all rookies and is tied for sixth among all backs with 16 runs of at least 10 yards through the first eight weeks, and he’s picked up either a first down or touchdown on 26% percent of his runs, tied for the tenth-best rate among running backs. Saquon Barkley and Kerryon Johnson are right on Lindsay’s heels, but after eight weeks, Lindsay just edges them out to lead the rookie backs in this 17-week-long race.